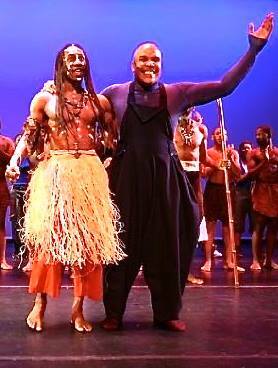 Abdel Salam and Obediah Wright at curtain call for Pure Elements. Mr. Salaam’s attended Herbert H. Lehman College as an undergraduate from 1968-1973 in their B.F.A. Program. 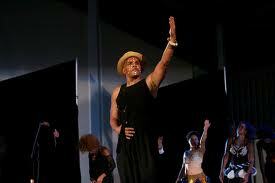 His professional skills include: African drumming; graphic design; costume design and sound design. 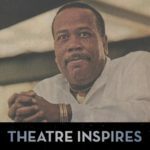 He received his additional Dance Education from Clark Center for the Performing Arts, The Alvin Ailey American Dance Center, The Chuck Davis Dance Academy, The Eleo Pomare Dance Center, The Fred Benjamin Dance Center, The American Dance Festival and numerous African Dance masters at home and abroad. He and his company are currently Artists in Residence at The Cathedral of St. John The Divine New York. A perpetual seeker, Abdel continues his quest for knowledge, wisdom, understanding and realization on every plane of being he is capable of reaching. Biographical update: Mr. Salaam recently completed his work on ” Katonga. Musical Tales from the Jungle” for Busch Entertainment Corporation at Busch Gardens/Tampa Bay in Florida. The three year project in which he was credited for all choreography and musical staging will run for approximately five years, and received the Entertainment Award for the Best Musical Show in the World within a theme park in 2004. In the fall of 2004. Abdel has been commissioned by the Tennessee Performing Arts Center ( T.P.A.C.) and The Nashville Ballet to choreograph an original work on their company to be performed as a part of their Emergence Series as well as to serve as a section of his new full length ballet” Eclipse: Visions of the Crescent and the Cross”, to be presented at T.P.A.C. during their 2006-7 season.